Are you looking for a tasty treat to serve guests at your Halloween get together? Thanks to Delish.com, we’ve found something scary good! Place a single layer of kettle corn on a parchment lined baking sheet. Mix in pretsels, make sure you have onlya single layer. Transfer melted chocolates to separate piping or Ziploc bags (with a corner snipped). 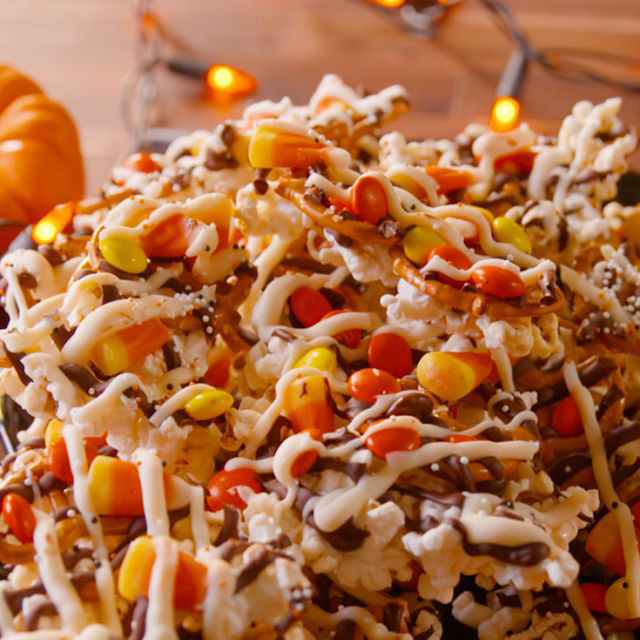 Drizzle kettle corn and pretzels with melted semisweet chocolate, making sure to drizzle lines very close together (you want the majority of the mix to be covered in chocolate). Top with candy corn and M&M’s and drizzle with melted white chocolate. Top with sprinkles and freeze or refrigerate until chocolate is firm, 20 minutes.